Morgan: Hi Riley, thanks for taking the time to have a chat with us here at 2 Smokin’. First off, fill us in on the background of BRC and what got you guys started. Riley: I’m stoked 2 Smokin’ saw what we are doing and is interested! BRC Engineering was founded in 1996 by my father Brian Will, my brother Carter Will and I. We have been gear heads all our lives with Carter becoming a Mechanical Engineer and myself as a Mechanical Engineering Technologist due to our exposure to mechanical devices at a young age. The machine shop was set up to manufacture for the Alberta Oil & Gas Market. What spun up early on was a Kart Racing shop where we imported products from Europe and supplied the local and North American Kart racing market. In 2002 we sold the kart shop and focused on manufacturing engines as part of our business. We continue to manufacture for the O&G Market, Medical, and tech sector. Motorsports has been a smaller part of our business until now. We have had as many as 44 employees and during down turns as little as 13 in recent years. We are currently 36 people strong. The BRC Team with their latest 500cc creation! Morgan: I see that a main focus of BRC has been on Kart Racing over the past years. What titles have you guys achieved so far and what engine capacity/configurations are in your current line up? Riley: Yes, our Motorsports division has developed the BRC250fe engine first, then the BRC150WW and BRC150RR, a Prototype 125cc gearbox engine, a prototype V-Twin 600cc engine, and now a Production 500cc 2-stroke engine. 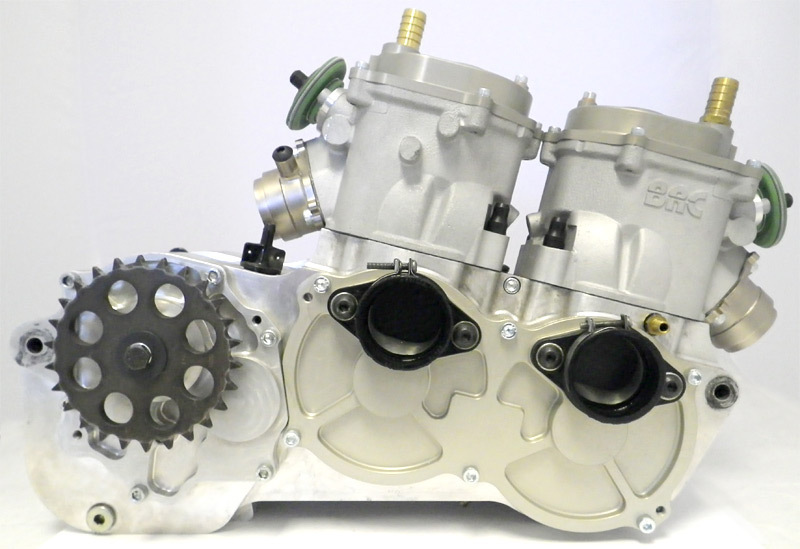 The BRC250fe engine is a 250cc twin cylinder, cassette gearbox, GP bike type engine designed for Superkarting. It has won titles all over the world and has been in a custom motorcycle on TLC’s Biker Build-Off show where Roger Goldammer set a world Record that still stands today. The BRC150WW/RR is a 150cc single cylinder non gearbox engine designed for sprint and dirt karting. It makes 56hp (41.8kw) when running dual methanol carbs and spins to 16K+ rpm. It has won numerous major UAS Karting events. The engine only weighs 24Lbs (10.8kg) so it packs quite the punch. The V-Twin 600 was a prototype that I developed for Timbersled. The idea was to be first to snow with a purpose-built SnowBike rather than a kit. Unfortunately Polaris bought Timbersled and we were left out in the cold. The engine made 120hp (89.5kw), 78.5ftlbs (106.4nm) and was as narrow as a single cylinder. Perfect for a SnowBike. We since had the drivetrain patented for a single ski and track snow vehicle hoping that in the future the OEM’s Go this way. 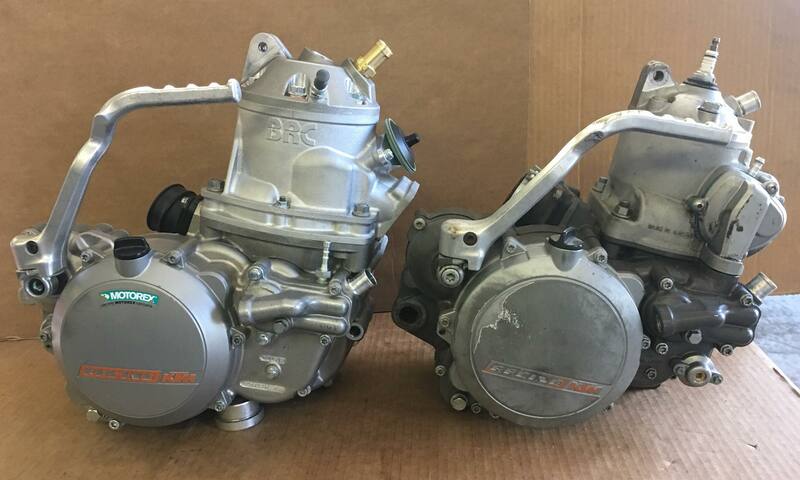 Morgan: Myself, as well as many others are super excited about the 500cc big bore kits for the KTM two strokes. Please tell us a few of the specifications, as well as which existing KTM components can be utilized. Riley: BRC500xc – Bore: 89mm & Stroke 82mm – Counterbalanced, Powervalve cylinder, Case Reed induction. The kit comprises of the cylinder, primary case, RH case, LH case, stator adapter, crankshaft, balance shaft, primary drive gear, head, all bearings and seals, exhaust and a piston kit. The bore is Nikasil. 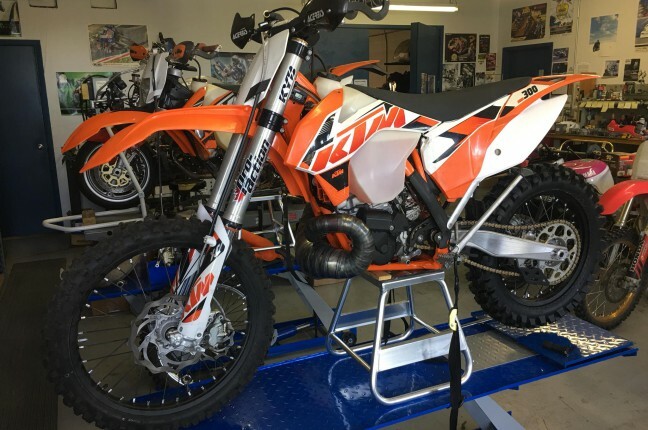 You use the ignition system, intake complete from carb inwards, transmission, clutch, kick starter, and electric starter from a 2007-2016 KTM250/300. Morgan: I saw the first clips have been released of testing. Julian Cerny (Canadian Pro Vet Rider) said it doesn’t vibrate at all, which is a major improvement over the older 500s! What was the initial feedback? Riley: First ride blew everyone away. 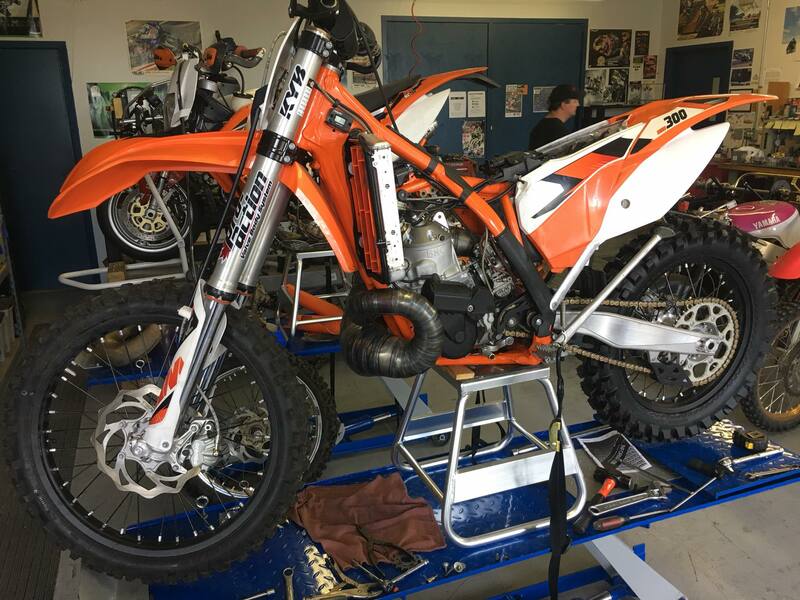 To be more fun to ride and faster than a Race prepped 2018.5 KTM450sxf Factory Edition was not expected. Julian has placed his order after riding it! Riley: That is the teardown after the 3 hours of riding we did. Waaaay safe on jetting and it was fast! Way more left in the tune. I’d say we are at 60% of its potential right now. Morgan: In your opinion, what will be the main benefits of running this kit, rather than using CR500/KX500 engines? Riley: After I built a CR500af for personal use, I found myself thinking that wouldn’t it be better if I was putting a current Tech 2T engine into a current chassis. Main benefit is the balance shaft and current technology cylinder design. Morgan: Although many people have done CR/KX500 engine conversions into more modern mx frames, a common remark is the vibrations, brutal power output and difficulty getting traction tends to fatigue the riders and make the bikes uncompetitive against 450 four stroke. Do you feel that your technology could be a competitive option if race bodies hypothetically allowed it? Riley: I absolutely think it would be a viable option. Our target output is 65hp (48.5kw). We are working towards a linear power curve just like a KTM300 has, just more of it. 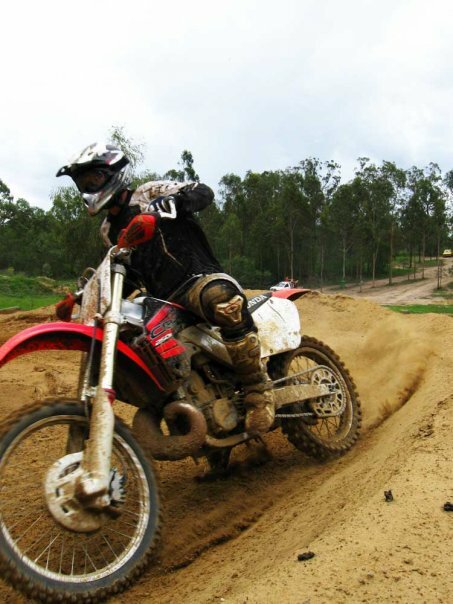 The balance shaft should deal with rider fatigue well. Traction will be down to the riders wrist and fitness level. 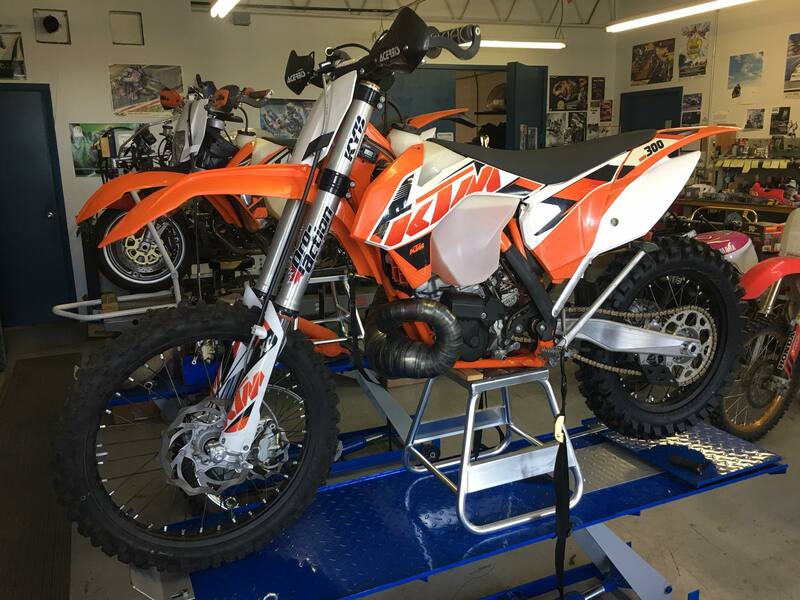 The BRC500xc on left and KTM300xc on right. Morgan: What models of KTM/Husqvarna/Husaberg will these kits fit? Riley: Designed to fit 2007-2016 KTM250/300 and the same for the repackaged manufacturers. No fabrication is required to fit it into the chassis unlike the CR5/KX5 conversions. Will likely be able to be assembled with the 2017 design donors, but without e-start and will require chassis re-tabbing. Morgan: Are there other components that customers would be required to source, such as different exhausts, reed blocks and carburettors? Riley: No, customers are not required to have to source any other components.That said, we will get to having exhaust options, 2 piece head options, and carb options in time. The stock 36mm carb is just fine, a larger carb will make more hp if that is your goal. We also provide a boring service for the 36mm carbs. Morgan: What are some of the difficulties that you have faced during this project and were there any particular constraints that you faced with redeveloping the KTM powerplant? Riley: The biggest hurdle has been time. We are just coming out of a major downturn and have to be extremely careful with both our human and financial resources. Designing has been relatively straight forward. We’ve used many technologies that weren’t around 10 years ago. 3D scanning and 3D printing to name a couple. Morgan: Will things like the gearboxes be capable of handing the extra power? Riley: Yes, the gearbox and clutch will not have a problem with the increased output as we changed the primary ratio so those components will see the same forces as they were designed to contend with in its normal application. Morgan: Please tell me a bit about the power valve setup, what sorts of adjustability will it have depending on the intended race application. e.g. Enduro, Motocross and Supermoto. Riley: The power-valve is a simple pneumatic operation. Easily tuneable with spring rate and preload adjustments. 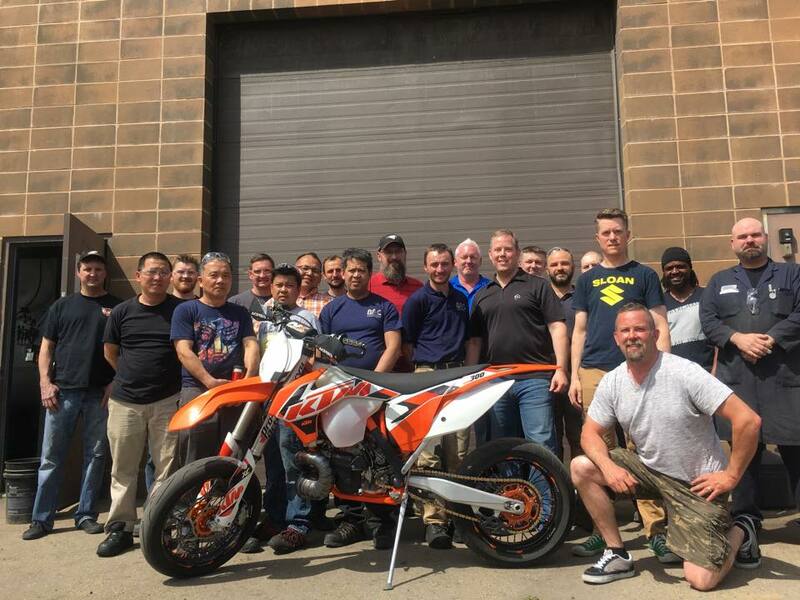 Morgan: Has KTM shown any interest or helped with parts at all? BRC: KTM has not been contacted nor have they contacted me. Morgan: I see that you have done a lot of prototyping using a 3D Printer. Has this made the development process far easier and more cost effective? Riley: 3D printing is a huge asset! It has allowed us to verify our engineering and physical fit. Also, it brought to light a problem that was caught before the cast tooling (expensive) was finished. Morgan: What type of power output are you expecting out of these? Riley: 65hp is our target. The cylinder will be good for about 90hp, but I have no interest in building an unreliable and peaky package. Smooth linear power is what we are after. I think we will have issues limiting it to 65hp though…. The cylinder turned out amazingly good. Morgan: What price range are you hoping for the kits to retail for? Riley: Our target retail price is $7500 cdn. Morgan: What stage are you at now and when are the kits likely to be available? Riley: We should have 10 engines available for sale in June. The exhausts will come for these engines in July as that is the last component of development. 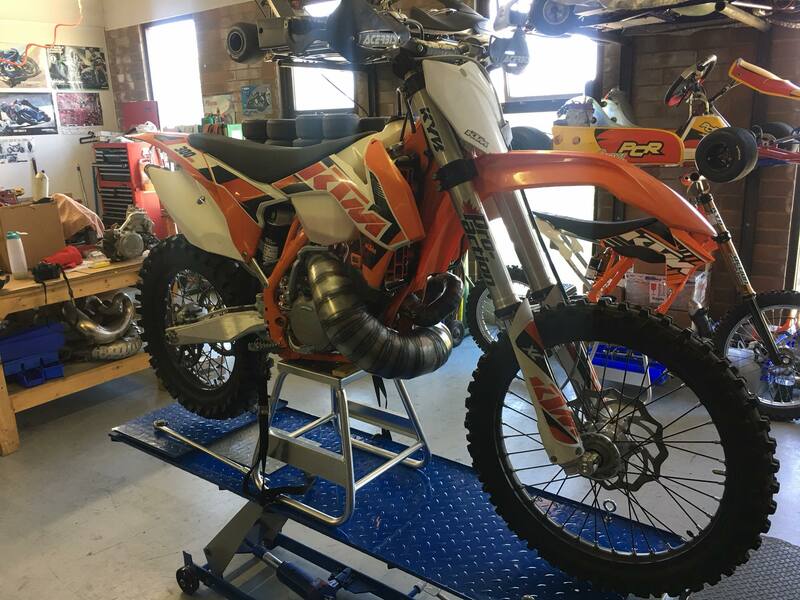 We are testing an existing CR500 exhaust to see how well it will work along with fit. Morgan: The new transfer port-injected KTMs and Huskys seem to show a lot of promise. Are there any injected kits on the horizon or are you in contacted with any third-parties that are keen to collaborate? Riley: We are working with David McCarthy of Two Stroke Performance in Australia for bolt on EFI. Target is to have this ready for December or the 2019 SnowBiking season. Morgan: Thanks for the interview, it’s so great to see a company taking a major step forward towards big-bore two stroke development. The quality looks superb and I can’t wait to see more pros riding them! If you’re interested in one of BRC’s latest 500cc kits, visit www.brceng.com, or if you would like to follow all of their latest Facebook updates on the 500, visit CLICK HERE.